A simple but fun physics racer. The gameplay concept of Extreme Road Trip 2 couldn't be simpler. You are in a car. Your foot is inexplicably wedged down on the accelerator. There's an endless sprawl of valleys and hills standing between you and the end of each attempt which is marked by a show-stopping explosion should you land without your wheels making at least some sort of contact with the ground. The controls are equally simple, with two buttons on the left and right of the screen. These allow you to stabilize your car for a decent landing, perform front and back-flips, or just get some serious air between leaps. It's not just about surviving for as long as you can though, as you have limited fuel at your disposal, and you'll need to top it up regularly by racing through the canisters on the floor. While it's a great blend of simplicity and competitiveness, Extreme Road Trip 2's real hook is the generous selection of vehicles available to buy from the cash store, some of which are a little bouncier, while others are just raw sleek machines of power. Each one of these has its own set of mission objectives associated with it too, so you'll be flipping, spinning and crashing for some time before you've mastered everything that the game has to throw at you. The coins you've collected on previous runs can also be used to buy a host of upgrades. Once you've mastered the delicate handling of the game, it's always worthwhile picking up the coin magnet before a run, as this will automatically draw all nearby coins into your stash. 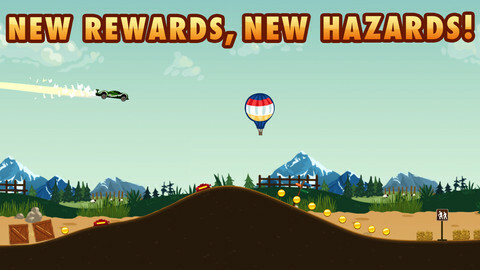 The nitrous boost not only gives you a speedy headstart, but also some extra power to launch off those hills and pull off some seriously impressive stunts. 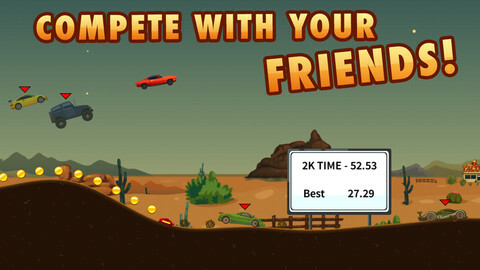 You can even compete against the ghosted high-scores of your friends, or your own best attempts. The cleaner your landings are, the greater the speed boost you'll be rewarded with, so hitting the top of the leaderboards takes some serious focus and control. Even at its fastest we never saw a dip in framerate across any of the game's many environments, essential when you're hoping to squeeze in just one more flip before hitting the ground. A special mention has to be made for the music too, which features furious foot-tapping chip-tunes that'll keep your nerves on edge. There are a huge number of endless games vying for your attention on the app stores, yet Extreme Road Trip 2 contains enough variety and fun to make it worthy of a place in anyone's mobile game collection. 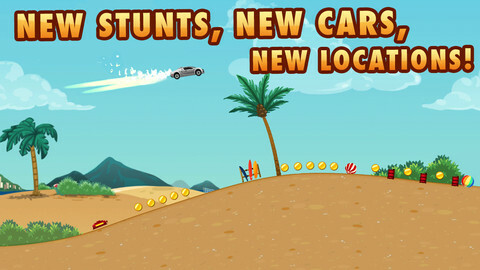 It's a challenging but fair game, it's packed full of incredibly satisfying stunts, and only the most obsessive completionist will feel hard done-by in the cash store. What's Hot: A simple but compelling physics racer with plenty of variety and competitiveness packed in. What's Not: The steering buttons are a little too large, obscuring the landscape from time to time. Repetitive after a time.